Interested in infusing your awkward small talk with a heavy dose of paranoia? Then Spyfall might be for you! Spyfall is a party game for three to eight players. 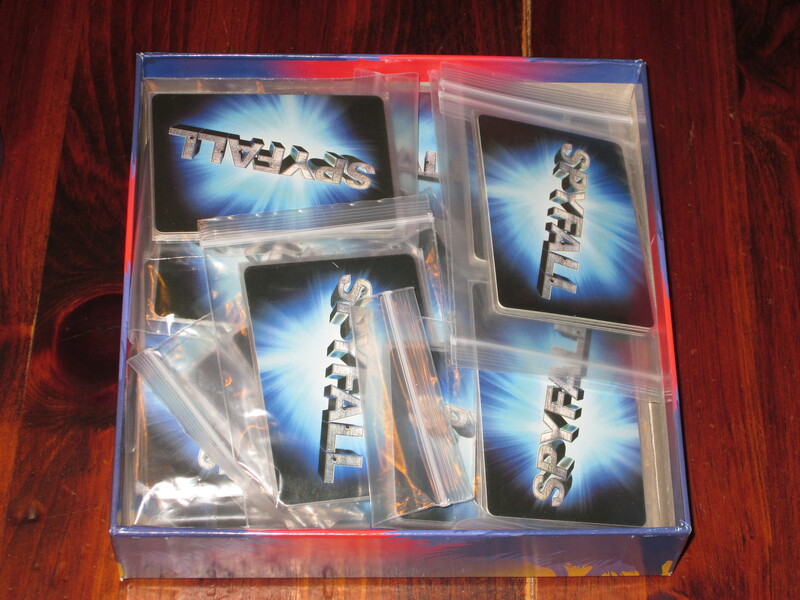 To begin a game of Spyfall, open one pack of cards. 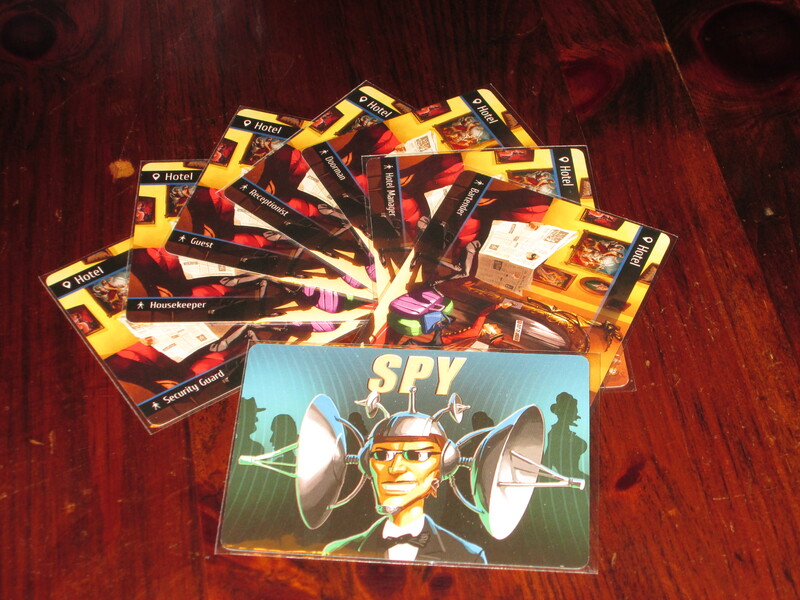 Each of the thirty packs of cards includes seven location cards (all the same) and one spy card. Mix one card for each player (one of the cards must be the spy card) from the pack together, and deal one card to each player. Set a timer for eight minutes. The player who looks the shadiest begins. 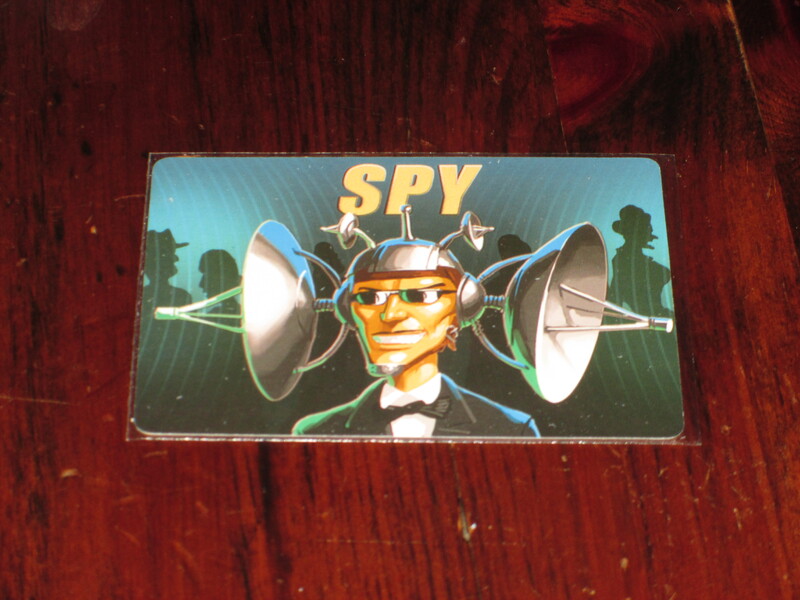 There are thirty packs of cards, each with cards for one location and one spy card. So many possibilities in this box. The player whose turn it is must ask a question of someone else in the group. The question can be anything–about the location or not–and the other player’s response can be anything. The goal of players who know the location is to find out who the spy is without giving away what the location is. The goal of the spy is to guess the location from the questions and answers other players are giving and to avoid detection. Each player can stop the clock one time to accuse another player of being a spy. If the group votes unanimously, the accused player reveals his or her card. The team wins if the revealed card is a spy; the spy wins if it is not a spy. If the vote is not unanimous, play continues. The spy may also stop the clock at any time and guess the location where the team is. If the guess is right, the spy wins. If not, the team wins. At the end of the eight-minute timer, players can make one final accusation (the spy can no longer guess the location). If the spy is revealed in the accusation, the team wins. Otherwise, the spy wins. There is a scoring system included to play the game over multiple rounds. Social deduction is a crowded field these days, with mainstays like The Resistance and Werewolf and newcomers like Coup and One Night Ultimate Werewolf eating up much of the table real estate. Is there room for anything new? Spyfall answers a resounding YES to that question, although it fills a different niche from the established entrants in the field. Spyfall puts the party back in social deduction games. While The Resistance emphasizes paranoia, Coup emphasizes bluffing, and One Night Ultimate Werewolf emphasizes deduction, Spyfall emphasizes creativity. Spyfall, in some sense, is a verbal Dixit. In Dixit, the goal is to give clues that at least one other player but not everyone will be able to guess. So you have to walk a fine line between complete transparency and complete obfuscation. The same fine line exists in Spyfall. You want to ask questions and give answers that simultaneously clue the team in that “Hey, I’m one of you!” and throw the spy off the scent of what the location is. One location deck. This is for the hotel. You can see at the bottom of the card optional roles for players to get into. And it is thrilling when this comes off well. The location was the Passenger Train, and I asked another player, “Who is your favorite saint?” He answered, “Aquinas, of course,” which is exactly what I was hoping for in asking the question. (Train–>Thomas the Tank Engine–>Thomas Aquinas.) The question wouldn’t have worked with everyone, of course, but it was a perfect shibboleth for him, and the spy was left wondering, Why are they talking about saints? Are we in a church or something? Sometimes clear and direct questions are best, and they allow the other player’s creativity to shine. In one game we were at the Crusader Army, and my mom, every time it was her turn to ask a question, asked, “Where are you sleeping?” She was trying to gain the intel that we knew we were in tents, but none of us wanted to say so, so we were doing our best to obscure it. “Wherever I can find a spot.” She missed the clues we were giving, but so did the spy, and the rest of the team knew what was going on. Of course, cleverness can backfire. I was once at the Day Spa location, and I was trying to find a question that didn’t make it obvious we were in a relaxing environment. I asked, “Do you prefer cobras, rattlesnakes, or asps?” Asp is an obvious anagram of “spa,” I thought, so if the other person was my teammate, she would clearly answer “asp,” and my other teammates would chuckle at my creativity and give me fist bumps after the game for being so clever. Instead, she answered, “I don’t like snakes,” and a vote was immediately called for. Unanimous against. I was blamed as the spy. And that’s the fun tension of the game: you want to be clever, but not too clever. You need at least one ally. And this is incredibly hard to do. It also results in hilarious situations that are a joy to watch unfold. This card is terrifying–TERRIFYING–if only because you know the questions that will soon come your way. There is another form of tension in the game. It is the tension of being dealt the spy card. Let me tell you, being dealt the spy card is terrifying. Where usually a colorful scene would be looking back at you from your piece of cardboard, instead you see a man in deep concentration with giant receptors on his ears. There’s no way out: you are alone. And it is awkward. It’s like being at your spouse’s work party and nodding along with jargon and inside jokes even when you have no idea what they’re talking about. It’s like trying to converse with native speakers with only your high school command of German. It’s like trying to blend in with a group of people you admire but disagree with. You are trying to come up with an answer that is good enough to be granted admission to the group but not so specific that it shows you clearly don’t belong there. It is a near perfect simulation of cool-kid jockeying in junior high. And thus, Spyfall will not be everyone’s cup of tea. There’s no way to opt out of being the spy, and Spyfall requires a lot of thinking on your feet, whether you’re the spy or not. Coming up with questions is often the hardest part for new players (and old alike), and some people just don’t like it. But Spyfall is, as I mentioned earlier, more of a party game than the other social deduction mainstays, and as such, it’s more forgiving. You don’t have to spin a web of lies. You just have to fit in, and this is a skill that most of us learn early in life. It’s hard to replicate in a game, and the consequences are entirely simulated, so it makes sense that players feel pressure and want to be creative. But you can almost always ask a basic question like “What are you wearing?” or “What do you like about this place?” and get a decent answer. 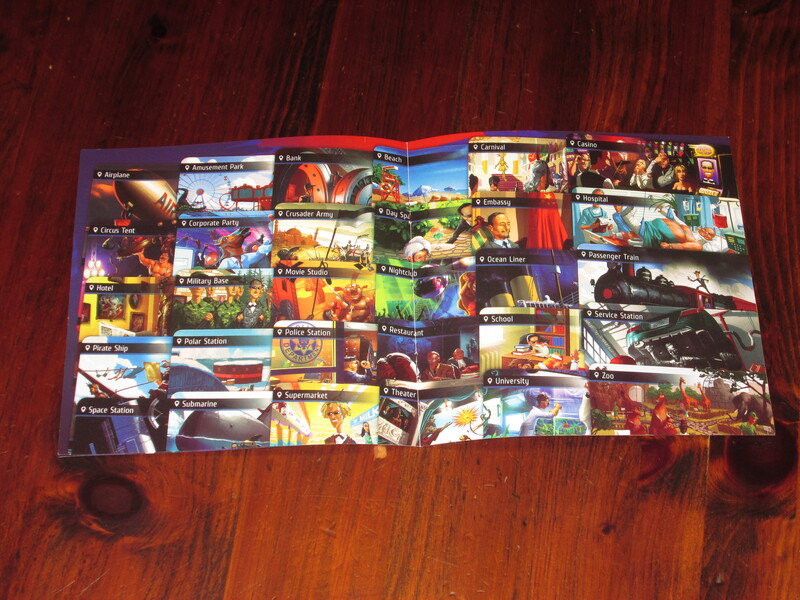 All thirty locations are included in this handy guide in the rulebook. Why isn’t a player aid included? (crickets) Your guess is as good as mine. The real negative of Spyfall has to do with components. It’s baffling that a player aid isn’t available for each player, listing the thirty possible locations. Especially for new players, this is a must, as it can be hard to enter the realm of possible locations without it. (Luckily, there are aids on Board Game Geek, and I printed eight of this card-sized aid to make playing the game easier.) The justification for not including the aid is “Only the spy would be interested in a list of possible locations!” But I’ve not found this to be the case. I’m equally interested in the aid when I know the location because I want my answers and questions to be vague enough to throw off the spy. The other game components are serviceable. The game comes with baggies to sort the game, and the cardstock is acceptable (although I still sleeved mine since I expect this to be played a lot and I play over lunch). The art in the game is good, although since it is an homage to spy movies like the James Bond franchise, some of the pieces are a little risque. Since the cards aren’t used much, this isn’t a huge deal to me, but it could be awkward in some situations. The cards include optional roles for players to take as they play, and that’s an interesting way to add flavor to the game if your group is so inclined. 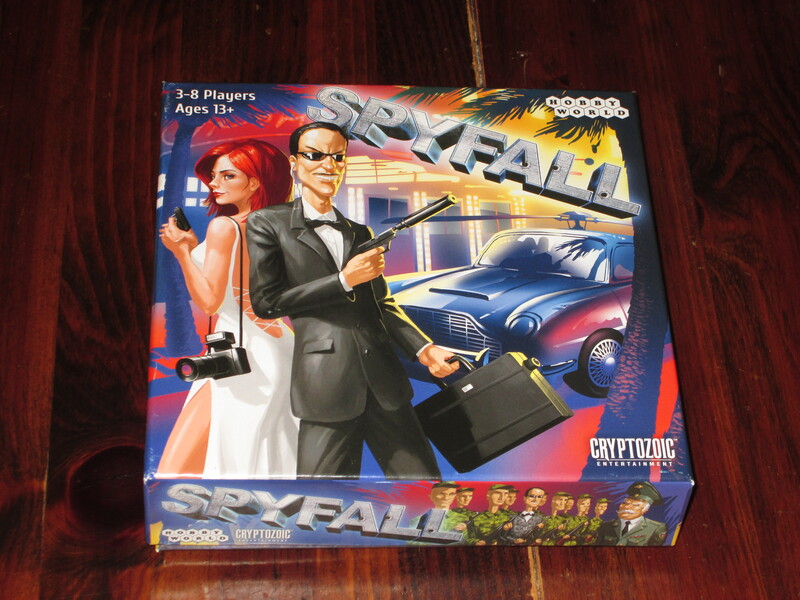 Spyfall is advertised as working with three to eight players. I’ve not played with three or four players, but with every count between five and eight, the game works flawlessly. (It’s a little easier on the spy in larger groups.) I suspect three players would be a micro game indeed, but four players could probably work with players who know what they’re doing and are comfortable being the spy. I don’t use the point system mentioned in the rulebook when I play, as most of my groups are more interested in being together and enjoying one another’s company than in who “won.” Your mileage may vary here. Spyfall is an excellent, excellent game. It is a way to get at the fun of social deduction without the moral quandary of lying, and it showcases the creativity of your friends. It’s the kind of game that gets talked about after it’s over, and it can take a few minutes to adjust to regular conversation once you’re done playing. (Why is that person asking that question? What are they trying to find out? Oh, that’s right–normal people talk to each other because they enjoy it.) While the game may not be for everyone, it’s probably as close to “for everyone” as the social deduction genre can get. It’s hard to say how much staying power Spyfall has–it’s still very new, and with thirty locations, you’re bound to have duplicates with the same group–but I’ve played many, many, many rounds and still can’t wait for the next game. Just please, oh please please please say I’m not the spy. I think I’m the odd bird in the group, because unlike most people, I actually like being the spy. I know, it’s hard to believe, but there’s something about the thrill of having no idea where you are and trying to come up with a generic question that could hopefully apply to multiple locations, thus covering the real location even before you know what it is. “Does this location build character?” I ask, convincing everyone that I was definitely on the good guy’s team. Except, that time it turned out we were at the university and I really had no idea. I just heard someone ask something about bricks, and I thought maybe there was something being built. Somehow I managed to craft a perfect question that threw suspicion completely away from me. Then again, “What did you have to drink last night?” was not the best question when I later discovered we were at the service station. I had no real excuse for why that question was so off topic, but I did manage to convince someone that there was enough doubt not to elect me. There is definitely a personality type that won’t enjoy this game, at least not at first. If you don’t do well under pressure creatively – there is always that 8 minute timer reminding you that you’re ruining it for everyone by taking 2 minutes to craft your angle of attack – you might find yourself overwhelmed, or unable to really participate. But I think this feeling can be lessened with experience, once you start to see the sorts of questions that get asked. I’ve gotten stuck myself trying to think of a good question and then ended up asking something completely absurd just to stop wasting time. Those are opportune moments for the spy to blend in – and the fact that they exist gives the spy some wiggle room with early, bad questions. “I just felt the pressure,” you say, hopefully after picking up some hints and asking better questions later on in the round. Sometimes you think of the most brilliant questions – “How much training have you recieved?” I asked, and the answer was somewhere in the negatory even though our location was, in fact, the Passenger Train. You get it, right? I was convinced fully that I had uncovered the spy, but unfortunately my brilliant pun passed right over the heads of half my team. The point I’m trying to make here is that really, anyone can participate, no matter how brilliant or subtle or uncreative they are. Brilliant questions and answers often get missed, and common questions – “How do you feel about the price?” “What are you wearing?” “Have you gotten used to the smell?” – can be added to a steady repetoire and used as go-to questions when the mind is blank. These are the sorts of questions that depend more on the answer than the question, and as a result aren’t tied to a specific location. Yet they aren’t suspiciously vague. If you can’t think of a thing to say, say one of those. One of these times, a flash of inspiration will hit you. And sometimes the axe really does split the log in two. “How much would I have to pay you to go outside and get a hotdog?” asked Andy. “Oh, just a couple bucks, I like hot dogs,” Blake answered. To which of course everyone immediately accused Blake of being the spy, because who in their right mind would go outside to get a hot dog when you’re on a Space Station. Moments like that are rare but hilarious, and the game ends immediately and you pick up and start a new one. 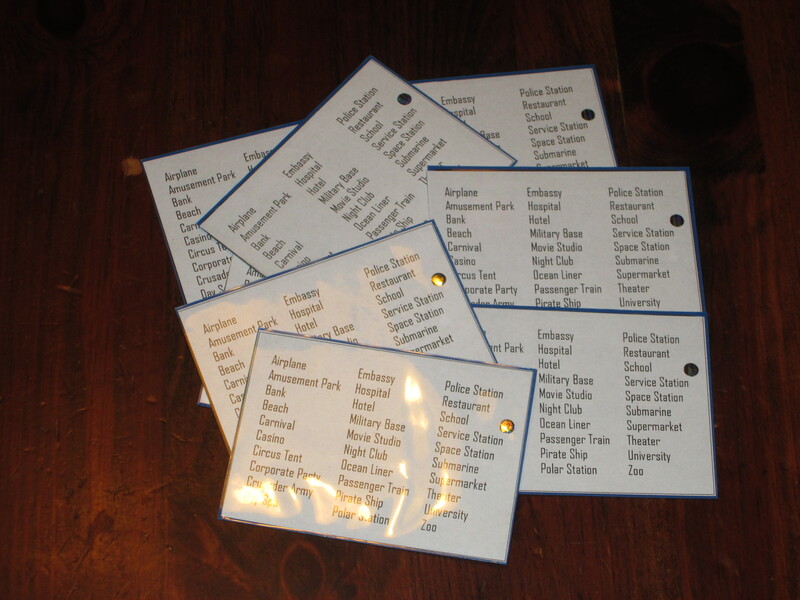 Homemade player aids (file from BGG). Ahhhh, that’s better! Most of the time, even questions that seem like they’re giving things away are still confusing to the spy, and people trying to be clever with their answers – or who are simply thinking along a separate but equal line of thought – end up looking like spies. We thought it’d be funny to sneak in a game where EVERY card was the spy card. Finally, if your players ARE having trouble blending in, you can always use the roles printed on each card. I tend to prefer not to use them, but they do add an element of escape. “Well, for my role, I would do this,” which might not make perfect sense as a generic answer, but could be excusable given that maybe that role is a worker in the back room instead of a customer. My conclusion is, even if this game sounds a bit terrifying – especially to end up playing as the spy – well, give it a try anyways. Think up some good, generic questions ahead of time you can use in almost any situation. You don’t have to lie or even maintain a poker face – no one can keep a straight face while all manner of ridiculous questions are being thrown around. People just have fun playing this game. I mean, most of the victories are technicalities – we just got lucky and guessed the right spy, or the spy thought they knew exactly where they were but guessed a wrong (but similar) location. It rarely ends with a surefire accusation, or a triumphant guess of the location. It doesn’t matter because everyone is giggling and having fun and asking stupid questions. It is a fantastic social game that inspires creativity and will have you talking about it long after wrapping up.